other than some fun vignettes I posted for Instagram. On Monday I yelled at myself for being so lazy and decided that I needed to accomplish something in the month of August. 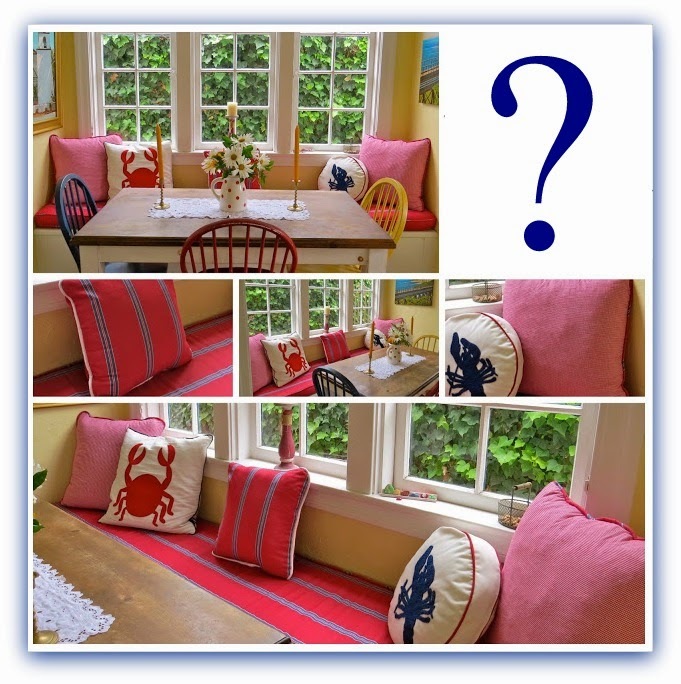 I made a new window seat cushion in July 2013, and have tried all sorts of different pillow combinations on the window seat, but the only pillows I liked were the lobster and crab pillows that belong to my next door neighbor. I found these pillows here and thought they might look cute on the window seat. 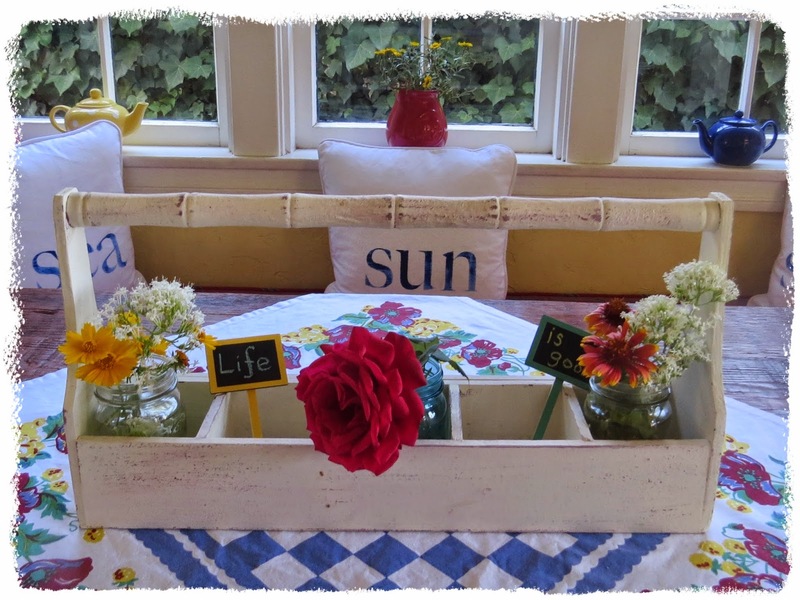 I painted the words with Annie Sloan Chalk Paint. 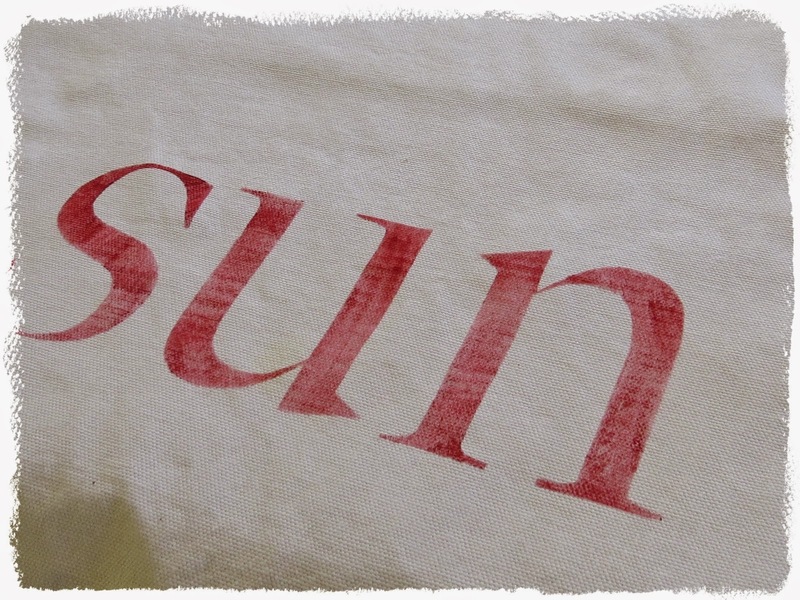 Unfortunately, I had eyeballed the placement and the word sun was too close to the right edge so I had to scrap that pillow and start again. This time I went with blue at my daughter's insistence. I like the crisp white pillows, but I was a little concerned about using beach themed pillows. I decided that since I do live in a little seaside cottage, it is okay for me to have a beach theme going on in the house all year long. a new painting, "Ha'ena From Tunnels Beach" hanging on the wall. I feel like I accomplished something more than just changing up vignettes around the house. Life is Good and I am ready for September and a long list of projects! Carol, your pillows and window seat cushion look great. And yes, you have the artistic license, beach or no beach, to decorate however you wish! The pillows look great, Carol. I need to make myself a list of projects for September. Maybe the old school feeling of starting fresh in that month will spur me to to getting things accomplished! You are soooooo talented! I just love them. And yes, it is permissible to have beach objects year 'round in a seaside cottage! We do! :-). Love the pillows. Your window seat is a sunny and cozy place. The pillows would look great on a boat, too. I think you accomplish a LOT! 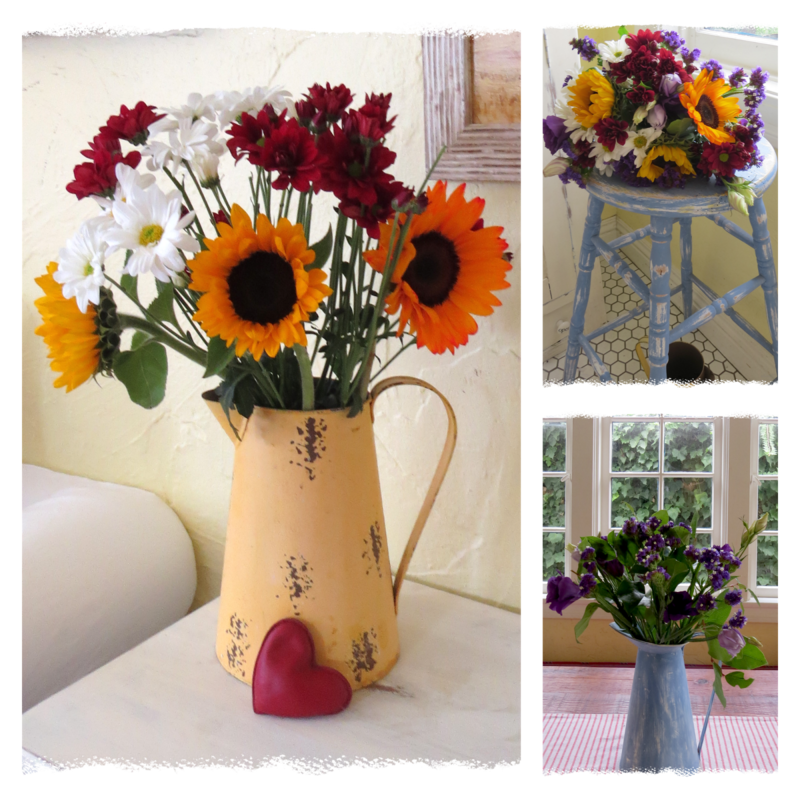 You always have fresh flowers and touches of color here and there. Everything looks so bright and cheerful. It helps that you hubby is an amazing artist, too! Love the new pillows! Hugs! I love the new pillows ~ and the new painting is gorgeous! 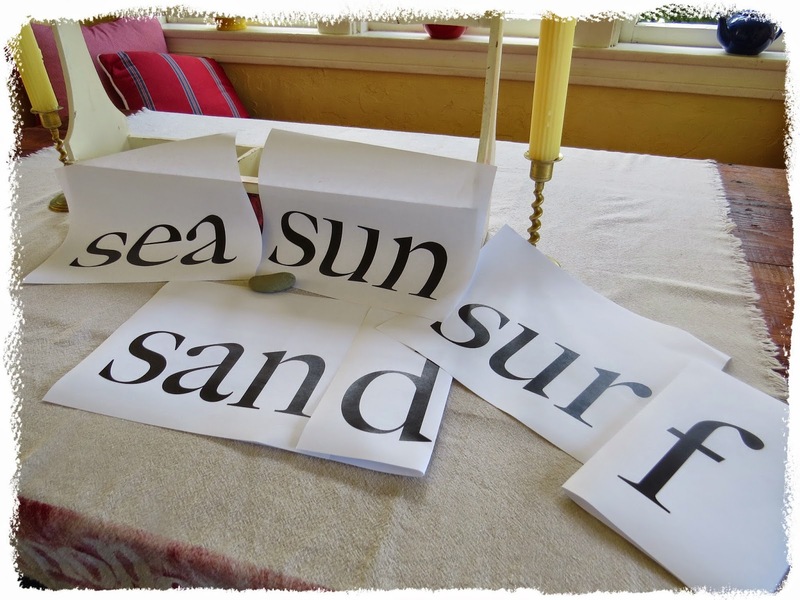 Sea, sun, sand is PERFECT for your cottage and they look great! I have been thinking of you with all the news of the huge waves on the CA beaches. Is your beach getting them? The new pillows are great and really look good on your bench. The new pictures is also terrific. I would say that you accomplished quite a bit - you even went on vacation. Call me stupid. I have seen so many words on things like pillows, wood, and such. I thought where do they get the stencils. I found some and they were expensive. 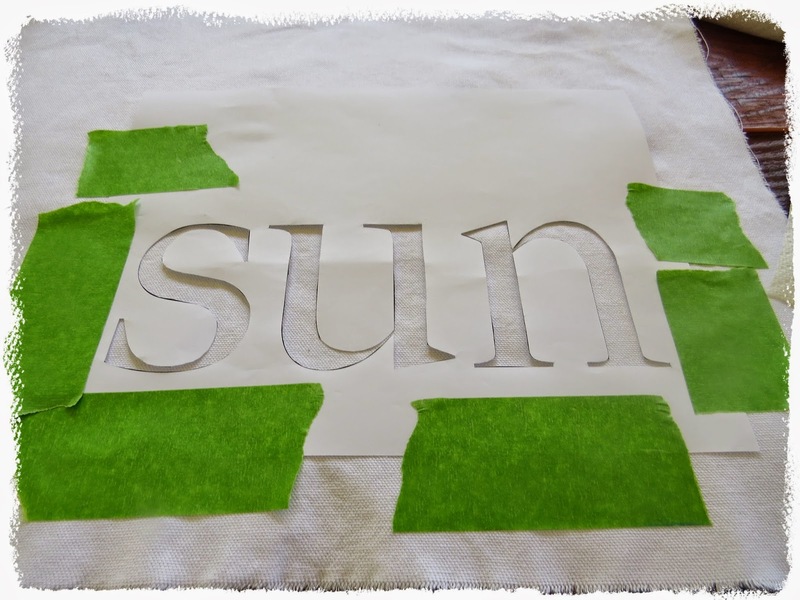 You have just shown me and easy way of getting any font word that I would like to use. Thank you Carol. There you go again my friend putting a smile on my face with your cheerful energy and creative soul. I adore your pillows and Steve's new artwork is powerful. I'm feeling like I'm fighting a cold so to see your sweet creations makes the poor sick me into wanting to get up and create. Happy a wonderful Labor Day celebration. You did a great job with those pillows. They look great. I have my pillow you made in my office and I think of you often. Carol, you are one person who never has to apologize for not accomplishing enough!! Love your pillows on the window seat! 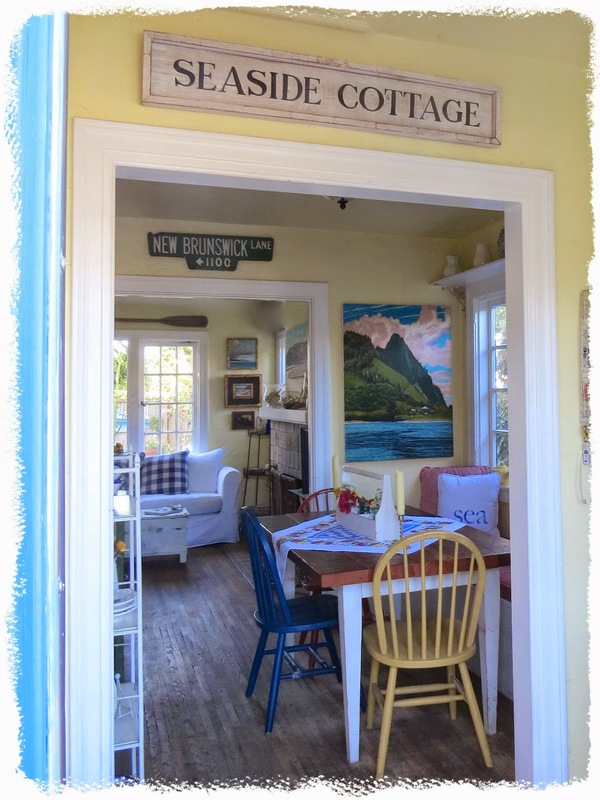 Of course a beach theme is perfect for your charming cottage!! 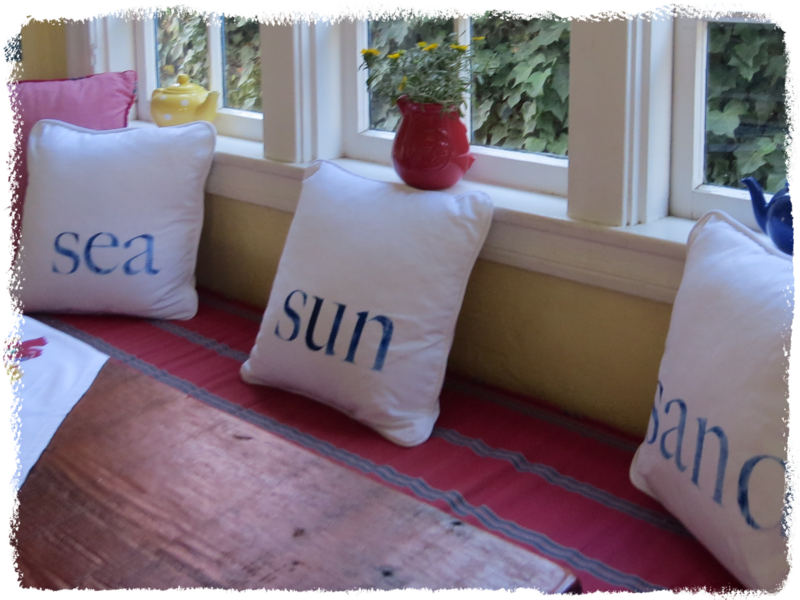 Love your new pillows they are perfect for you beach cottage home. Super sweet. 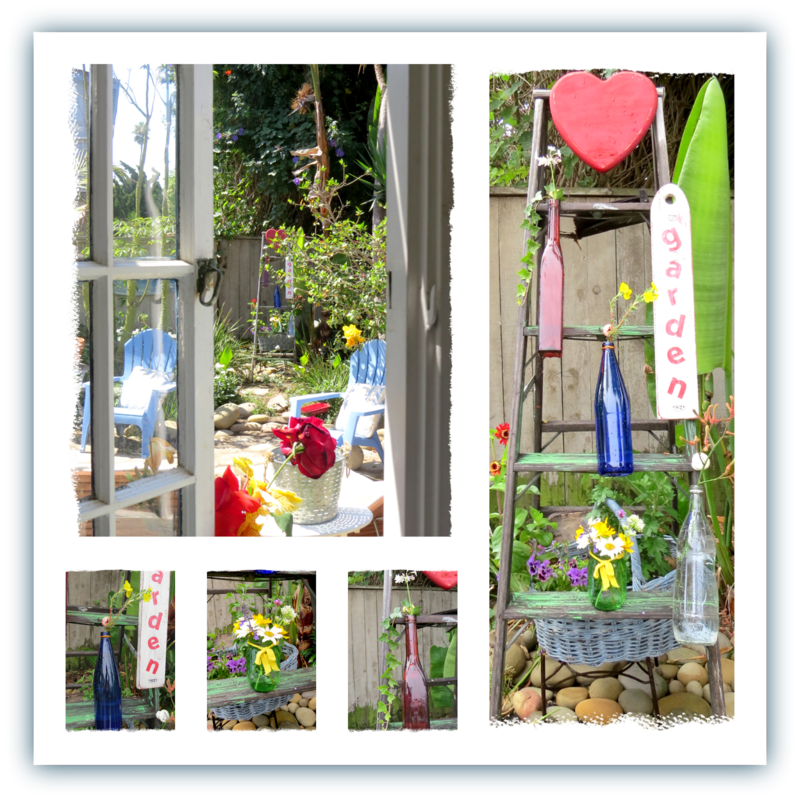 Love Steve's artwork it goes so well with all your creative treasures. Gosh with all the things you do give yourself and break and a nap for August LOL! Have a great evening. You still got a lot done in my opinion! Love your home and always look forward to your projects and changes! Yep...blue is the perfect color for the pillows. Beach theme is always in style when you live on the coast! Your vignettes are always fun to look at, you do such a great job with them. Carol, YOU MUST think about making a magazine. Your DIY projects are just amazing, and I must say that photo of your area with Steve's painting? SUBLIME. I could sit there are smile all day long. Thank you for the contribution you make to the blogging world with your art and arrangements. And tell Steve HE ROCKS! Carol, you get more done in a month than most of us do in a year! 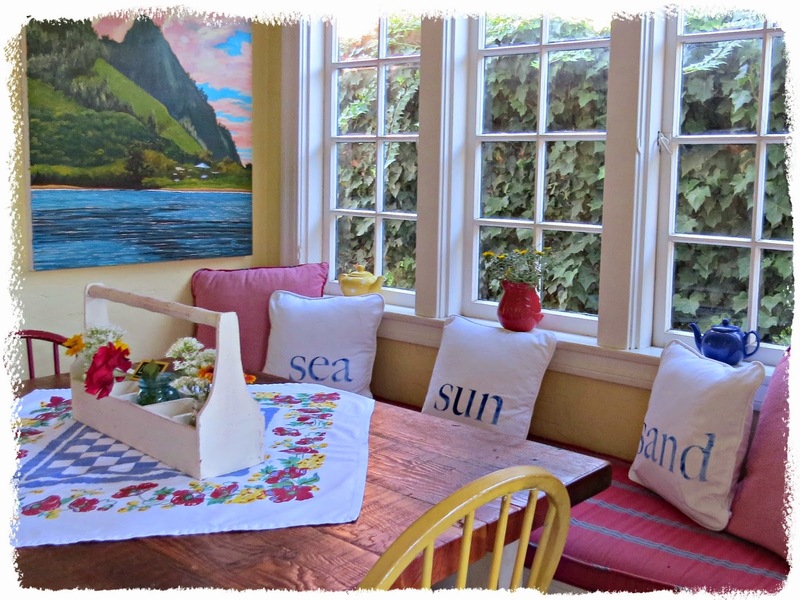 Your newly made pillows look fabulous in your dining room and they're perfect for your location! And I spent the afternoon, on a whim, a wisp of a whim, hanging quilts on the walls. Guess I'm ready for winter. Or at least ready for it not to be over 100 degrees every single day, and I don't even get a glimpse of the ocean, you lucky girl. I LOVE YOUR HOUSE! I love your beach theme with the fact that you live near one! It makes more sense for you than me. You did such a good job on those stenciled pillows. These are just so cute, you creative lady! I love that you went with the blue, it looks a little more beachy and you have every right to do that, no matter where you live, but especially because you DO live near the ocean! Love your cute new pillows and maybe your neighbor will give you hers when she tires of them. Love the pillows and the new art! I'm sure others have said something similar, but you amaze me with how many projects you take on and complete in record time. You're an inspiration! How wonderful is to create your own stuff! The pillows are super and the blue is a good choise. Your dining room looks so pretty and fresh Carol. Like you, I am wondering where August has gone? Actually, I feel that about the whole year! I love your seaside pillow idea, simple but very effective. Like you, I'd have gone with the red. Good Morning Carol, I love your new cushions and the colour blue was a perfect choice. You live in such a beautiful climate that the beach theme is one which you can enjoy all year round. I love visiting you as you always spur me on to 'get myself into gear' to do things. August tends to be a bit of a lazy month for me, but with September just around the corner, and colder days following, that is when I organise myself more. Carol I have sent you a private email, which might have ended up in your junk box.... would you mind taking a peek. LOVE them Carol - and of course you can have them year round ( you could even if you didn't live on the beach in my opinion ) because I just may copy this !!! The pillows are great--clever of you, and I like your centerpiece. I love your beach theme all year around, Carol. But, you are like me, always changing and rearranging! I don't know where the time has gone either. I'm so behind on things. Your seat cushion is so pretty Carol as well as your pillows. The pillows you make are always super cute! You should open and etsy store! 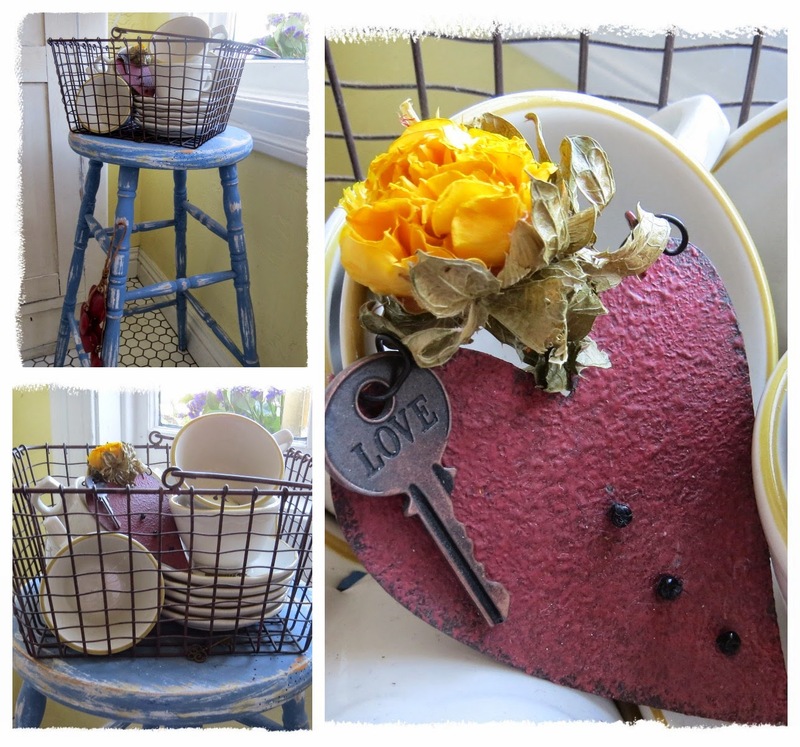 Oh, I love playing with vignettes around the house. If anyone can have beach decor all year round, it's you!! :) I love your attitude, and I love your pillows. Hi Carol, I love your pillows in the window seat. 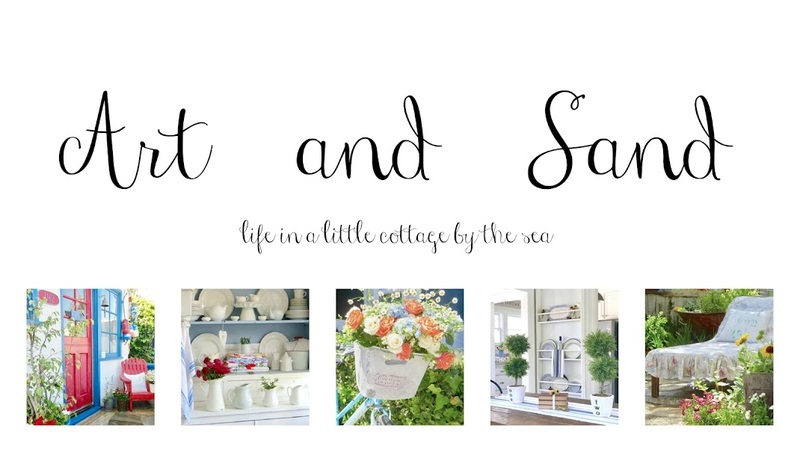 I think having beach decor out year round is perfect for your cottage by the sea. You are so talented. I love the process you used creating those pillows. Great pics. I love your pillows and that white tool box on the table is adorable. Love your new cushions. The perfect choice. 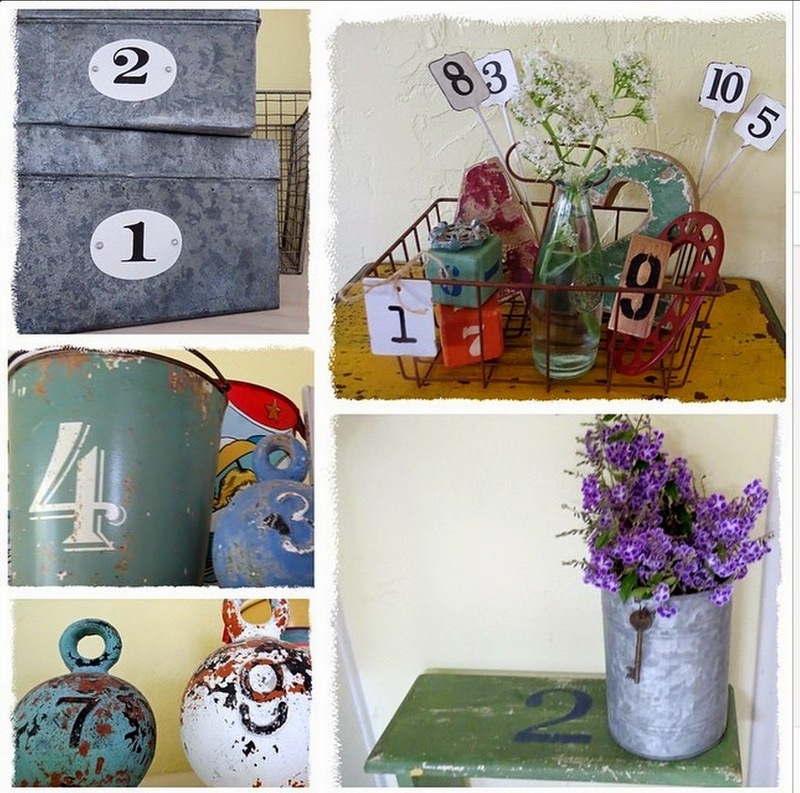 I love Annie Sloan chalk paint too. I just wish it wasn't so hellaciously expensive, or I'd use it more often. 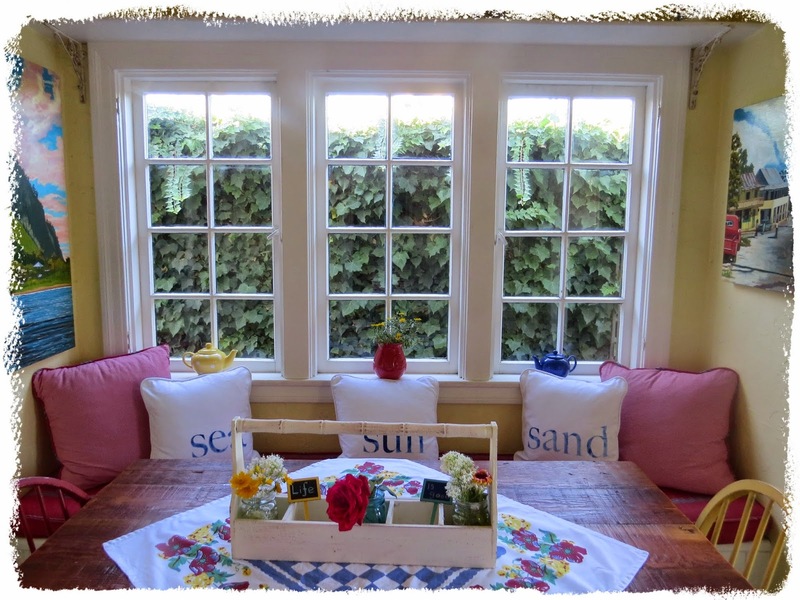 I love the cushions and of course it's ok to have a seaside decor all year long! I actually think of it has a privilege when the end of August come and long lines of cars are forming on our roads from people going back to their normal life away from the sea! Carol, I agree that the pillows work all year for your sweet beach cottage. They turned out so cute! August did just fly by and I don't feel like I have accomplished much either. Oh well, enjoy life. . .plenty of time to work. lol! Thanks for sharing with SYC. Cute. Very cute. But I do really like your neighbors pillows. 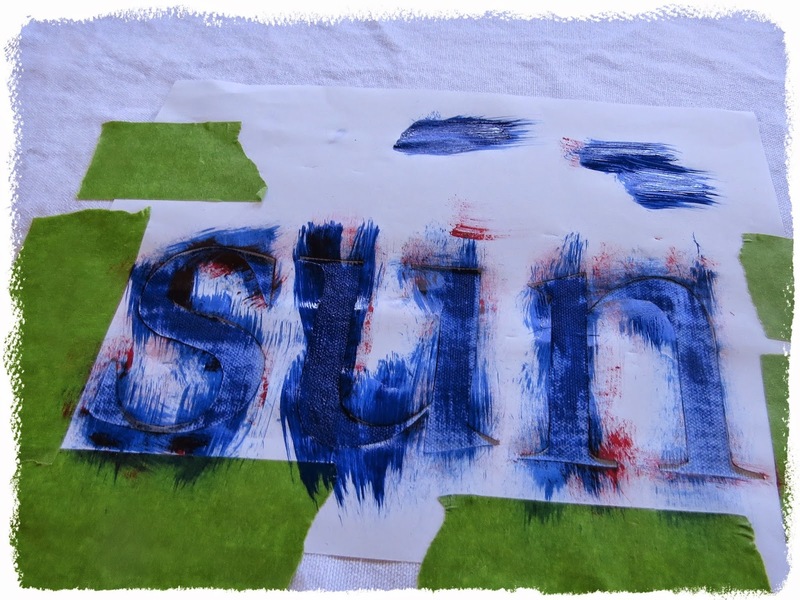 Why don't you trace them and make a stencil and paint some for yourself? I'm wondering if maybe August should just be a wash. Seems like we all suffer from Augustitis. 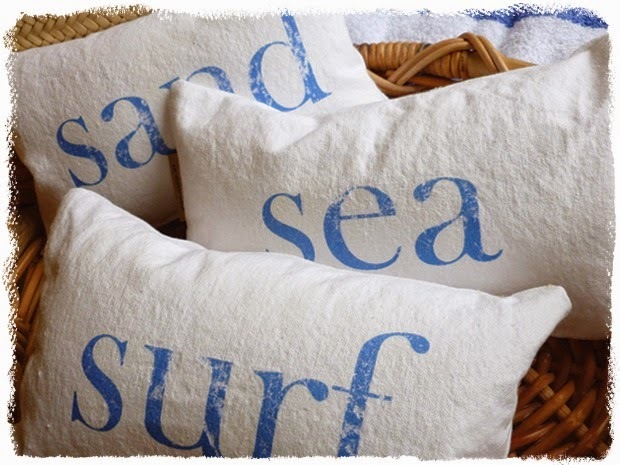 I just love the Sea - Sand - Surf pillows you made...so simple and they make such a statement. Sorry I haven't commented recently...been traveling and finally getting caught up. And BTW, you deserve to take August a little slow after how busy you are blogging and creating the rest of the year. Enjoy the rest of this beautiful weekend! Your pillows are perfect! August seems to be one of those transitional months for me too. Time to get serious tomorrow...can't believe it's already September. Love your pillows. Fresh and beachy looking. I would use them year round too. Time sure does seem to go by fast! I always feel that days go by slow but years, fast, very fast! Lovin your new beachy pillows, and if you live near a beach it seems perfect you'd have beachy pillows! You nook is so comfy and cozy, I'd be sitting looking out the window all day. Hope you labor day weekend has been a good one. Oh, I'm working on fall but not putting out, I don't like to rush seasons. I seriously doubt that you are ever lazy, lol. Sometimes it's good just to let life lead you "wherever" and if you don't get anything accomplished, it's OK. Trust me, I'm preaching to myself on that one, too. Your window seat cushion and pillows are fantastic. The fabric of the pillows and the words are just perfect for that space. the cushions look great on the windowseat. I need to get going on some projects that need doing here too. Good luck with yours. 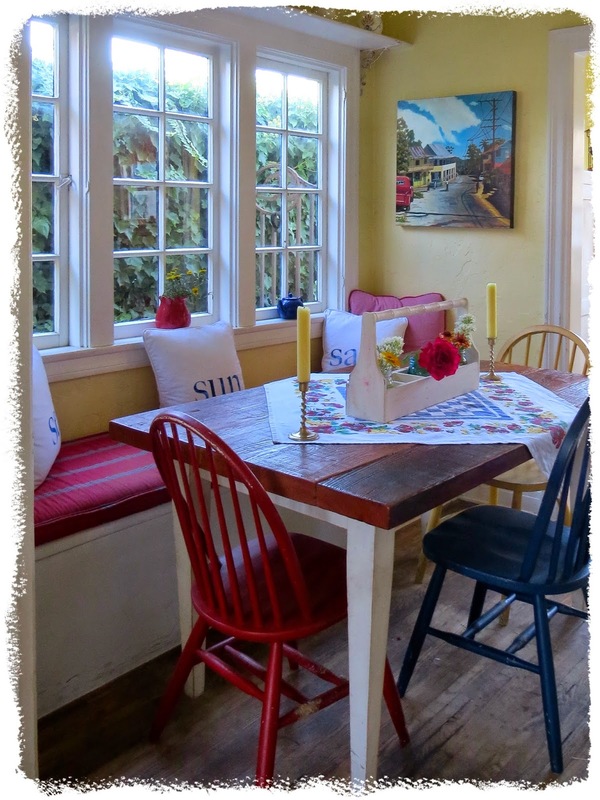 How much cuter can that dining room, and the entire cottage get??!! Just when one thinks it's complete on the 'cute' checklist, there you go making it even more adorable! You live near the sea and the sand and you are covered in that California sunshine, so yeah, I'd say it's pretty safe to show off those pretty pillows all year round! beautiful! i love the color those pillows bring in, and i love a good window seat. They're perfect all year round ! Please join me for another walk . . . Starting at the ground floor . . .
My latest addiction . . .